Chemical, physical and thermal properties of ethanol (also called alcohol or ethyl alcohol). Phase diagram included. Ethanol, C2H5-OH, is a volatile, flammable, colorless liquid with a slight characteristic odor. It is produced via petrochemical processes or naturally by the fermentation of sugars by yeasts. Ethanol is most commonly consumed as a popular recreational drug. It is a psychoactive substance and is the principal type of alcohol found in alcoholic drinks. It also has medical applications as an antiseptic and disinfectant. The compound is widely used as a chemical solvent, either for scientific chemical testing or in synthesis of other organic compounds. Ethanol is also used as a clean-burning fuel source. The phase diagram of ethanol is shown below the table. as well as Thermophysical properties of: Acetone, Acetylene, Air, Ammonia, Argon, Benzene, Butane, Carbon dioxide, Carbon monoxide, Ethane, Ethylene, Helium, Hydrogen, Hydrogen sulfide, Methane, Methanol, Nitrogen, Oxygen, Pentane, Propane, Toluene, Water and Heavy water, D2O. Ethanol is a liquid at standard conditions. However, at low temperature and/or very high pressures it becomes a solid. 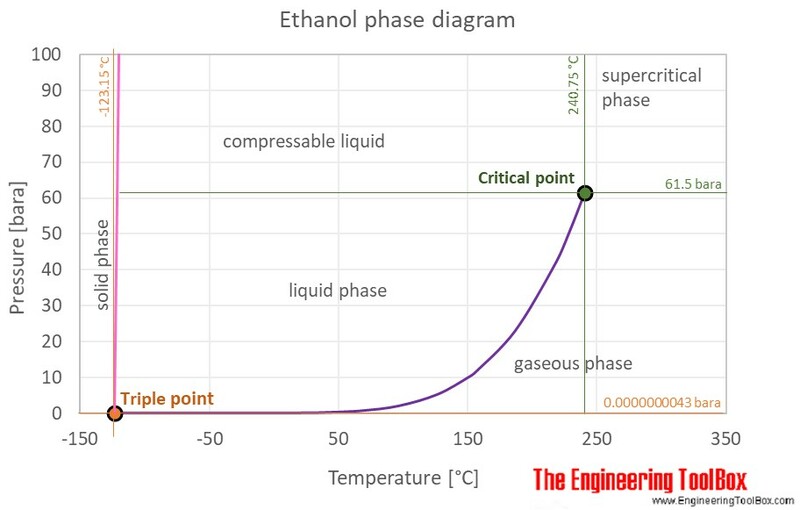 The phase diagram for ethanol shows the phase behavior with changes in temperature and pressure. The curve between the critical point and the triple point shows the ethanol boiling point with changes in pressure. It also shows the saturation pressure with changes in temperature. Engineering ToolBox, (2018). Ethanol - Thermophysical properties. [online] Available at: https://www.engineeringtoolbox.com/ethanol-ethyl-alcohol-properties-C2H6O-d_2027.html [Accessed Day Mo. Year].